Can you put a price on peace of mind? At Meridian Security we provide the ultimate in security systems in Leeds including burglar alarms, wireless alarms, alarm repairs, CCTV, lock repairs, high security anti snap locks as well as a specialist key cutting service. With over 3,000 security systems in place and more than 30 years’ experience in the security industry, you can be assured that when you choose Meridian Security you will be partnering with a professional company with a wealth of experience. 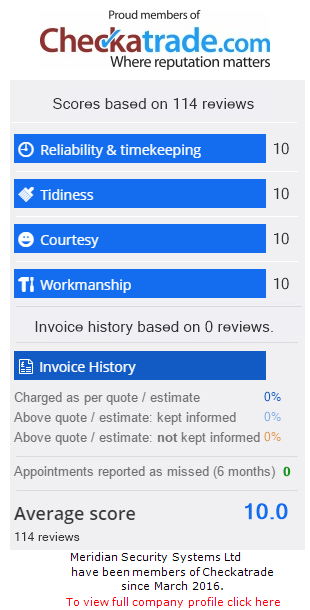 We are proud members of checkatrade – read our excellent reviews. service at a fair price. Meridian Security are SSAIB Approved Alarm Installers. Certification with SSAIB is a mark of excellence. SSAIB (Security Systems and Alarms Inspection Board) only certificate companies that can demonstrate technical and managerial competence through an inspection of the processes and procedures they operate. You can be assured that our Business & Home Alarm Systems are fitted by qualified and fully trained engineers. Take a look around our shop with Google Virtual Tours! Meridian Security shared a post. Take some simple, quick precautions, stay safe and enjoy your Easter weekend. PLEASE HELP! Last night, around 11.30pm, someone came into our house on Holtdale Green and helped themselves to our possessions. The valuables can be replaced, but they also took our son’s school bag, which contained all his work, and his revision materials for the GCSEs he is about to sit. The thieves will have had no use for them, and could well have dumped the bag, so we’d really appreciate it if people in LS16 could keep an eye out for a black and grey rucksack, which may still have an Avengers logo keychain and an Overwatch logo keychain attached to it. The work inside should have his name – Sean Stevenson – on it. There may also be a blue lunchbox inside. If anyone spots it (the thieves were in a car, so they could have gotten quite far from our street before dumping it), please could you message me. We’d really appreciate it. Thank you.